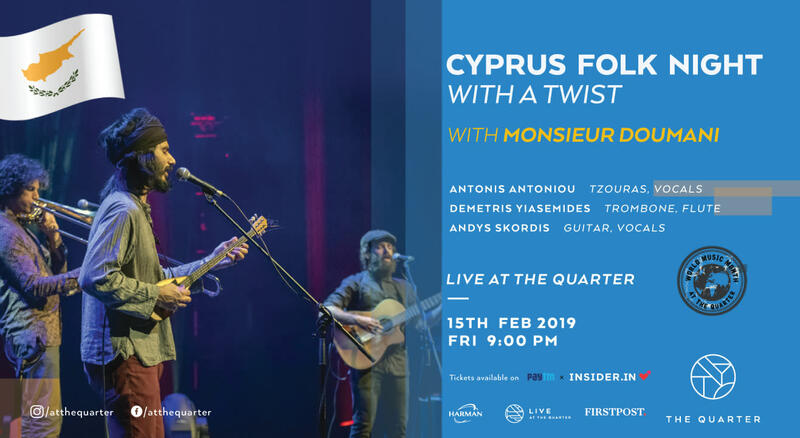 Multi-award winning group Monsieur Doumani, was formed in 2011 in Nicosia, Cyprus by Antonis Antoniou (tzouras), Angelos Ionas (guitar) and Demetris Yiasemides (trombone, flute). Coming from different musical backgrounds, but influenced by the Cypriot tradition at various levels Monsieur Doumani compose Cypriot songs that draw inspiration from contemporary Cypriot society as well as from the shaky conditions of our era. The original identity of the project was determined by the adaptation of Cypriot traditional pieces, with a special contemporary color in sound and mood, forming a style distinctively their own. Their live appearances in festivals and venues worldwide (WOMAD, Rudolstadt, FMM Sines, Konzerthaus Vienna, Paradiso, etc) have been very well-received by diverse audiences and their music has been presented on radio stations around the globe, such as BBC, NPR, Radio France, Sveriges Radio, PBS FM Melbourne etc. Monsieur Doumani have received the ‘Critics Award’ at the Andrea Parodi World Music Awards 2018 as well as the Awards for ‘Best Arrangement’, ‘Best Cover of a Parodi song’ and the ‘Young Audience Award’. Monsieur Doumani have released 3 studio albums which gained them their worldwide recognition. Their third album ‘Angathin’ has attracted great interest on an international level receiving the prestigious 'German Records Critics' Award' (Preis der deutschen Schallplattenkritik) in the category 'World Music'. It has been voted as ‘Best album of 2018’ in the Transglobal World Music Chart. It has also climbed at the top of the World Music Charts Europe in May 2018, was given the title of 'Top of the World' album by British magazine 'Songlines’ and was one of the Top 20 albums of the year in the 2018 fRoots Critics Poll. In March 2015 Monsieur Doumani released their second full-length album, ‘Sikoses’, which gained them a nomination in Songlines Music Awards 2016 in two categories: ‘Best Group’ and ‘Europe’.. Sikoses also reached No.1 in World Music Network's June 2015 chart and No.1 in the November 2015 Transglobal World Music Chart. **We are serving specially curated Brandy Sour for the night!